Since the beginning of 2015, in order to receive a working visa and a work permit, foreigners in Russia have had to take an exam to test their knowledge of the Russian language and the country’s history and laws. RBTH spoke to several of those who have taken the exam: Some are satisfied, while others say the experience is costly and difficult and presents opportunities for unscrupulous operators to exploit. Acquiring a visa to work in Russia has never been a straightforward process, but a recent change to legislation has introduced a new hoop that those wishing to gain employment in the country have to jump through – a language test. 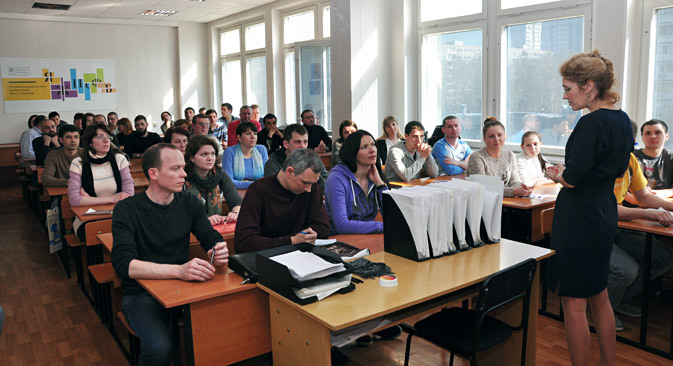 Starting on January 1, 2015, in order to receive a work permit or a working visa in Russia, foreigners have had to take out a medical insurance policy and present a set of documents to the migration service, with the most important being a certificate proving they have passed a special exam that costs 5,000 rubles ($92). The language, history and law exam is taken in authorized centers set up in large Russian universities, such as the Lomonosov Moscow State University and the Pushkin State Russian Language Institute, as well as in the offices of regional administrations. There are more than 400 such centers in Russia. The exam is divided into three parts, each with 20 questions. The first part tests the person's knowledge of Russian lexis and grammar. The second part explores how well the foreigner knows the main dates and events in Russia's history. The third, meanwhile, is devoted to the foundations of Russian law and state; for example, to answer one question the person has to choose the correct image of the Russian currency and flag. Candidates have an hour and forty-five minutes to complete the exam. According to the Russian government, 3.5 million foreigners will have to take the exam in 2015, with the majority being from the former Soviet republics of Central Asia. The Ministry of Education and Science said that in the five months since the new law went into effect almost 700,000 working migrants have taken the test. However, not everyone is able to pass the first time. Margarita Rusetskaya, rector of the Pushkin State Russian Language Institute, noted that "15 percent of foreigners do not pass the exam the first time, but statistically this is acceptable, and they have an opportunity to take the exam a second time." According to the Russian Federation of Migrant Workers, one in every three foreigners is unable to pass the exam. "The Russian language is definitely very difficult," said Amin Madjimuder, president of the federation and an immigrant from Bangladesh. "A lot of time is needed to learn it, at least three months. The questions regarding Russian history are also difficult. According to our data, almost 30 percent of the people fail." Simon Schuett, a German editor from Moscow’s German-language newspaper Moskauer Deutsche Zeitung, took the exam this year in order to receive a working visa and did not find it complicated. The only part that gave him cause for doubts was the third section, the one dealing with law. "I later told Russian friends about some of the questions and even they didn't know the answers, because they were about details of migration law,” said Schuett. “Luckily, four out of the 10 questions were pretty easy and asked for examples to choose the Russian flag or currency. So with a bit of luck and multiple choice in the law part, I passed the exam." Yet the new requirements remain unclear, with numerous Westerners reporting having acquired a work visa since the law was introduced without being asked to take the language exam. Amin Madjimuder said that besides the difficulty of the exam, migrants are also concerned about its cost: The fee represents a lot of money for someone, for example, from one of the Central Asian or Caucasian republics who fails the exam and has to take it again. Interest in the Russian language is secondary when a foreigner is short of money and time, said Madjimuder. "The main motivation is to legalize one's status and receive the permit. Athletes and students learn Russian in a different format. They have more time to dedicate to it." Another problem that foreigners face is the attitude that officials and organizers have towards them, said Karomat Sharipov, a representative of the Tajik Working Migrants movement. According to Sharipov, certain organizers "take advantage of migrants' naiveté." "Money decides everything," said Sharipov. "In Lyublino [a neighborhood in Moscow – RBTH] agents asked us for 36,000 rubles [$660] for the full set of documents. Then you come to take the exam, fail and the money is gone." Simon Schuett, who took the exam at the Pushkin State Russian Language Institute, did not encounter such problems, even though the organization was not ideal: "The exam took me half a day, so organization was far from perfect, but there weren't real ‘problems’," he said. However, there is a network of about one hundred centers to assist migrants in preparing for the exam. The Russian Orthodox Church also intends to help migrants learn Russian. Last fall the church published some special textbooks for foreigners, which, besides grammar, include some practical advice: how to treat Russian women and how to behave in public places. The textbooks also provide information on Russian traditions, festivals and cuisine.